World Boxing Council president Don Jose Sulaiman has announced that the WBC board of governors will vote on whether to declare the interim super featherweight title fight between Humberto Soto and Francisco Lorenzo a no contest or to declare Soto the winner by knockout. Sulaiman condemned the decision of referee Joe Cortez to disqualify Soto as a "gross injustice" and one of the biggest he has seen in a long time.He said the officials "should have accepted the WBC rule of instant replay and if they had, they would have seen what happened." Since the fight was for the interim title Sulaiman stressed "the decision for the world is our's. The decision for the municipality is theirs" providing another insight into the WBC's differences with the Nevada State Athletic Commission which insists on appointing referees and judges for all fights and ignoring the sanctioning bodies. 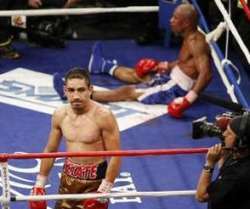 Sulaiman told well-known boxing writer and television reporter James Blears that the WBC had reviewed the instant replay and discovered there was "absolutely no reason for the disqualification" pointing out that Lorenzo had "gone down to the canvas refusing to fight." After lengthy consultations with NSAC officials at ringside Cortez disqualified Soto in the fourth round for allegedly hitting Lorenzo at the back of the neck with what is referred to as a "rabbit punch" and a cause for disqualification. However, it was clear that it was a glancing tap after Lorenzo had already gone down from a flurry of punches and was badly bloodied and didn't want to continue. The WBC did not award the belt to Lorenzo because of the controversy. Don Jose said he was also puzzled by the actions of referee Cortez who "intervened twice to stop the fight when they were exchanging blows. There was no clinch. So I don't understand that in a referee with so much experience." Discussing the possibility of a rematch Don Jose said "I don't know if Lorenzo would like a rematch after what happened because he was really getting a beating the like of which I have seen very few times in recent boxing. In the third and fourth rounds it became a one-sided fight." The decision of the WBC governors will be known within seven to ten days.